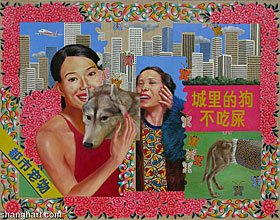 Beijing and Shanghai, like almost any major city in China today, have very vibrant and quite autonomous art scenes. Sometimes housed in decaying industrial ruins of former combines and equally well linked up with universities and galleries, these colorful nests, theme parks of contemporary arts, clusters of photographic ateliers, painters, sculpturists and performers are already pretty much commercialized. Many creative individuals, however, refuse and withstand commercialization of their art in the “socialist market economy” of China today. They continue to work alone, in isolation, or in very small groups and unlikely locations. Our pro bono work in international art exchange mainly intends to provide opportunities to those individual unknown artists in China, to show their work abroad, interact with fellow artists in the world, direct subsidies their way, and arrange commercial opportunities for them. This activity is not part of the commercial service offers of Dongfang. It is very rich and fulfilling to experience, share and support the surprisingly pluralistic and liberal arts scene in the perimeter of our commercial work in China. And it provides an excellent opportunity to keep in touch with the latest trends and currents, to the benefit of our commercial clients. www.amazon.de - well known and warmly recommended by DONGFANG for your background reading matter about China. DONGFANG member of Amazon Partner Program. www.freightworld.com - Service-Site and Links concerning commercial shipping; many links to shipping lines and cargo tracing. www.stihl.de - Stiehl Tree-Dictionary, (almost) all about trees and wood. 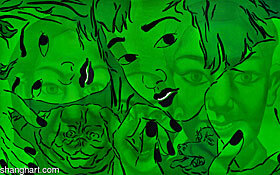 www.animal-health-online.de - Animal-Health News - not just for Veterianrians! www.asiatravel.com - Good Hotel Guide for Asia, online booking available. www.vetlex.com - Veterinary Law, Associations, Approved Installation Lists, etc. www.flughafen-fmo.de - our regional Air Hub, online timetables for arrivals and departures, etc. Contents of external links referred to on this website are not regularly reviewed. They remain exclusively under the liability and responsibility of the providers. We do not assume any liability for any damages occurring due to the use of links given at www.dongfang.de.